Everybody loves this movie. It’s got heart, magic, music, adventure, romance, and ambitious special effects that alternate between stupendous and hilarious. Hang it, even I love this movie. And yet, to be perfectly frank, it’s a bit of a mess. Given its production history, it’s a wonder it was ever made at all. Hungarian-English producer Alexander Korda was determined to create a grand epic, a career-defining masterpiece, and inserted himself into every aspect of the film’s production, sometimes causing chaos. Shooting started in early 1939 with German director Ludwig Berger, but he wasn’t delivering a story on the scope that Korda wanted, and then that war thing happened, so Berger was replaced by three other directors, all English or American. Throughout production the story was in flux, constantly changing, with new elements added and other parts cut. When war actually broke out in September, 1939, further production in the U.K. was suspended, and the whole thing was picked up and moved to Hollywood, with side shooting in the Grand Canyon. Whew! Somehow Korda took all these disparate assets and assembled a mostly-coherent whole, but one can see the seams where he stitched it together in continuity lapses and sudden changes of tone. And yet, all that hardly matters, because this Arabian Nights fable is so vivid and dreamlike that dream logic seems to hold it together. Certainly the romance that’s ostensibly the plot’s driving wheel is flat and rather dull, as John Justin (King Ahmad) and June Duprez (Princess—that’s all the name she gets) don’t provide much heat, chemistry, or interest. Perhaps they knew they were hopelessly outclassed by the real stars: the young thief, the evil vizier, and the mighty djinni. In truth, this is their movie. The thief, Abu, is played with engaging panache by the fifteen-year-old Sabu (that’s all the name he gets), a lad of genuine charm from India. The great German actor Conrad Veidt is Jaffar—wizard, tyrant, lecher, and all-around wicked vizier—and he has a fine old time with the rôle. But no one is having as much fun as the African-American actor Rex Ingram as the Djinni, whose energy and gusto would make him seem 90 feet tall, even if he wasn’t already being depicted as 90 feet tall. The story is loosely based on Doug Fairbanks’s 1924 silent epic, with a half-dozen other familiar Arabian Nights elements tossed into the stew to keep things bubbling. There’s a flying carpet, magical curses and transformations, grotesque monsters, and voyages to unknown lands: picking up from its silent predecessor, this is the film that set the style and tone for all the Arabian fantasy films to follow, up to and especially including Walt Disney’s Aladdin. Warning: the European colonialist gaze is strong here. There are people of all different skin shades in Bagdad, but lightness of color is the infallible guide to status. This is somewhat offset by the prominent casting of the brown Sabu and the black Rex Ingram—but damn. As for the film’s look, “sumptuous” doesn’t even begin to describe it. 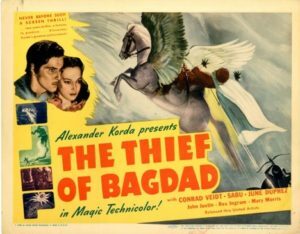 Visual wizard William Cameron Menzies, whose credits stretched back to the 1924 Thief of Bagdad, was Korda’s associate producer and uncredited fourth director, and his eye for form and color deserves much of the credit. The excellent score is an early effort by Miklós Rósza, best known for his soundtrack for Ben-Hur (1959). There are some hokey songs—for part of the production cycle Korda thought he wanted the film to be a musical—but the orchestral pieces are dynamic and memorable. Guilty pleasure: The picture’s screenwriter, Miles Malleson, gets to play the delightful rôle of the dotty old Sultan of Basra, who collects magical toys. I have to say, seeing the script guy having such fun warms my writer’s heart. And even C. Aubrey Smith would be envious of his amazing whiskers.